Executive summary: The matrix organization structure is a remnant of the dark past, plaguing the landscape of innovation and complex product development to the present day. Get rid of it now, because in the new economy it’s going to drag you down to a sinister organizational death. Should you be in the lucky situation of not having heard of the matrix organization structure, let me shortly summarize it for you. The main idea is to separate the management functions of functional and project management into two separate sub-organizations. You do this by defining a “Line” hierarchy consisting of traditional manager roles like Team Leader, Group Leader, Department Head, etc… along job functions, and a “Project” hierarchy consisting of project roles like Project Manager, Program Manager, Portfolio Manager, etc… along the projects the organization is undertaking. The figure above shows the result: A highly structured, well defined organization, that is very capable of monitoring and controlling the individuals, teams and projects. At least, for the first glance. For a more detailed description and a fair analysis from around the time when the matrix was invented, refer to Ref. . If you call an extensive management hierarchy a water-head, double it to imagine the Matrix. I’ve been working with a big international corporate once, where 65% of all the employees were managers. No joke. You couldn’t throw a stone without hitting a manager. What a double water-head is capable of, that makes it so attractive? Double Command and Control: As is typical for hierarchies, command travels downhills, workers report uphills. If somebody up in the hierarchy does not like what they see in the reports, comes divine intervention (“corrective action”). You have this structure doubled, where the project hierarchy controls the projects (scope, budget, schedule, …) while line management has the control over the individuals (called “resources”) and the tasks (“work packages”). All these artifacts give the sense of everything being under control. Great career paths for management: The matrix provides great career paths and sophiticated titles like “Senior Technical Program Manager of XY” for the ones interested in management. Power: The Matrix is always an unnecessarily inflated organization. More people means (for some) more people to have power over. It looks good on your CV that you have been in charge of an organization of a hundred people, even if twenty people could have done the job. Politics: If you are interested in politics, the Matrix is for you. The double hierarchy of management grants you a lot of opportunities to wallow neck-deep in corporate politics. If you are at the bottom of the hierarchies, it’s less of a fun though. You will have to serve a single team lead and probably multiple project leads at the same time, who are all driven by different goals. This ensures that you won’t hear the same opinion on a given matter from any of them. … no Teams: In the figure above, the spots are individuals with delivery responsibility. They belong both to a “team” (row) and to at least one project (column). 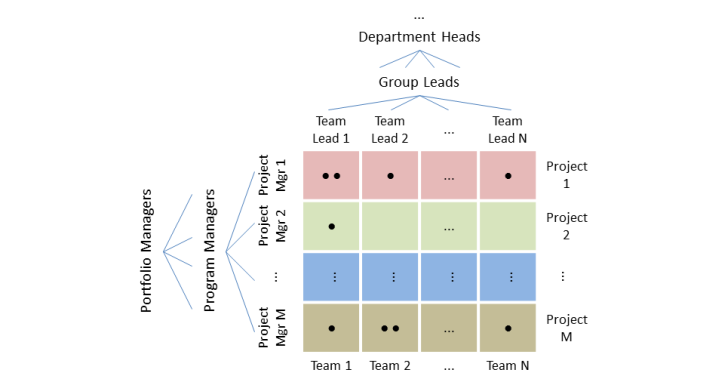 A “team” in a matrix means the set of people belonging to the same line manager and belonging to the same functional silo. As you can rarely find two individuals within a “team” working on the same project, the only thing they have to do together is to sit in the same (typically weekly) reporting meeting to report to the line manager. Since they work on different projects, this is not only boring, but also a complete waste of time. … no focus: In a matrix it is very common that an individual is working simultaneously on multiple projects. The huge waste context switching causes when one is trying to solve multiple complex problems at the same time is very well researched in the literature (see e.g. ). What this brings though, is satisfied middle management: It looks like as if everything would proceed in parallel — a great achievement, isn’t it? No need to prioritize and no need to be accountable for the results of the prioritization. How satisfied executives are with the actual results, is another question. … no collocation: The people working on the same project are the ones who should collaborate closely, but location is determined by the functional teams and not by the projects. Collocation by project is anyway impossible if people are working on multiple projects. … no self-organization: With all the different teams and projects, no two manager share the exact same goal. Heavy negotiations and political fights stand behind every decision made, creating an artificially competitive environment that demands the full attention of managers. There’s no chance that team members could see through the continuous turmoil while trying to deliver, which keeps them unaware of the larger context. They can’t formulate valid opinions on the direction of their own work, so they get tossed around as resource puppets by their managers who are better positioned to see the political landscape. Forget about self-organization in such a hostile environment. … no transparency: Everything being under control is a mirage. The organization is so complex that no human is able to see the status of all the running activities. All those managers with different goals need to be constantly negotiating in order to keep the projects above the water. In a Matrix you rarely see the managers during normal office hours: They are sitting on meetings all day long, trying to align themselves with the others. If they also want to get stuff done, they need to take overtime and to risk burn-out. All in all, an agile organization is about the efficient and precise delivery of what the market needs, while the Matrix is about management, complex politics and a continuous struggle for power and influence. The two pull the organization in the opposite directions. Want to go from Matrix to Agile? The matrix organization idea is a remnant of the dark past, when organizations and consultants tried to handle increased business and product complexity by increasing the complexity of the organization itself, in order to exert more control. Some large organizations I worked with felt the need to reduce the risk of their agile transition by defining agile structures in addition to the matrix one (ever heard about the role “Scrum Master / Project Manager”?). My opinion is very solid on this. For the above reasons, the matrix will never get agile. Sticking to the matrix greatly increases your risk of a failed transformation. If you want reduced risk, start with pure agile on a very small scale (1–3 delivery teams plus 1 management team) and grow this seed organically at the expense of the matrix organization. This gives you a chance to experience the full power of agility without jumping into the unknown. Then, if you scale careful enough, you’ll notice and get rid of the impediments standing in your way, before you scale them too big with the forming agile organization.